After 1 year of Chunin Exams monthly, we've decided to scale back on the frequency of Chunin Exams to build up more anticipation for each of them. As such, we will be alternating between hosting Chunin Exams and Wars on the first Saturday of every month. More information about war events coming soon! As it goes, every thing else remains the same, including the time of the event. May will be a War Event, June will be a Chunin Exam and so on..! 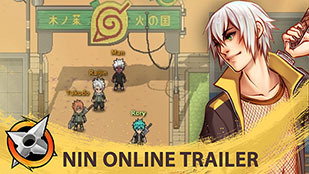 As the start of a new initiative to fulfill the initial design of Nin Online's ranking system. Beginning April 2018, there will be a Joint Chunin Exam, where both Sand Ninja and Leaf Ninja will participate in, on the first Saturday of every month. The event registration will take place at 1pm EST and the entire event will commence at 1:30pm EST. It may last anywhere between 1 - 3 hours depending on how far our Genins make it. Participants are expected to stay throughout the event for the best chance at promotion. The registration location will be announced in-game each month, on the event registration time. You are to form your own teams of 3 before or during the registration phase. There is no level requirement! Academy Students are not allowed to participate, you have to promote to Genin rank if you want to participate. The entry fee for each team is 15,000 Ryo, prepare to hand over the in-game currency to Shiken during the registration phase after a GM has verified you through the gate. Chunin/Jonin can enter teams to help conduct better RP, increasing chances for promotions. However, entry fee will no longer be waived for teams with Chunin/Jonin team leaders. Missing Ninja cannot participate in the Chunin Exams. Kages of each village have the right to debar ninja from their village from joining. Valid reasons include (but not limited to) misbehavior, breaking treaties, disobeying commands. In order to run the event smoothly, your cooperation is required, as such, rule breakers will be kicked from the event which may result in his/her entire team's disqualification. Unless you need to ask a serious question, stay in character during the event. If you choose to go AFK and you miss calls for you, we will not wait for you. If you disconnect, quickly reconnect and inform a GM. Nothing is prohibited unless stated first by the proctor. The GMs will give instructions on what is prohibited in that particular exam. For example, unless explicitly stated, Chakra Pills and Blood Pills are not banned from use. While these aren't rules, it is recommended to try you best so that you have the best chance for promotion. Make good use of any time given to showcase your RP and your character. Dress for success. If you're a Sand Genin, dress like a Sand Genin. If you are a Leaf Chunin, dress like a Leaf Chunin. Build relationships with the other participants beforehand so that RP is unique. Stand out in your own ways. The 4th Chunin Exam will be the last grand spectacle Chunin Exam, as of moving into beta phase and running the game as a service, we have to steadily move towards running regular events rather than grand unique ones. I can't promise changes on each exam, but we will try as often as possible. We also had the first Tie in a Chunin Exam match up during the Sand village chunin exam between Booty Gang Pinku vs. Zelda. An amazing moment! It's always a hard decision to not promote everyone who deserves it, for me, assigning ranks is an easy task, and I know it is a big deal to you. So trust me when I say, it's harder for me not to just feel like giving everyone the Chunin/Jonin ranks. It's hard to see people lose. It's hard to see people win and not get promoted, but it's also what makes for a better story for everyone, and to maintain the rank system in the game. Getting Chunin rank will always mean something really big in Nin Online, and I hope that everyone understands the vision for why I have to hold back on giving everyone ranks..! An early notice that Chunin Exams will not take place in October, so September will be the last chance for awhile! December Chunin Exams is postponed until further notice due to server instability! We will be holding a re-examination for the month of January on 12th January 2019. All ninja who paid to join are eligible to join with ryo fee waived for their entire team!